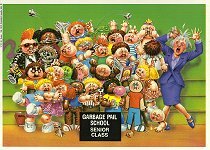 The United States Garbage Pail Kids Giant Stickers is almost identical to the United Kingdom Garbage Pail Kids Giant Stickers except for a few subtle differences. The cards from the United States Garbage Pail Kids Giant Stickers have glossy card backs, and the cards from the United Kingdom Garbage Pail Kids Giant Stickers have matte card backs. 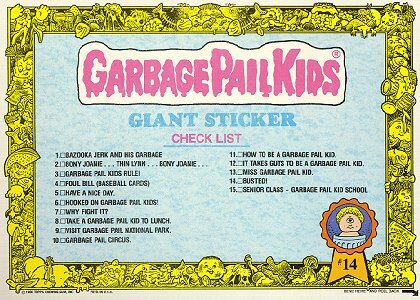 The United States Garbage Pail Kids Giant Stickers have "©1986 TOPPS CHEWING GUM, INC. PRTD. IN U.S.A." printed on them, and the United Kingdom Garbage Pail Kids Giant Stickers have "©1986 TOPPS CHEWING GUM, INC." printed on them. The United States Garbage Pail Kids Giant Stickers pack wrappers have "©1986 TOPPS CHEWING GUM, INC. DURYEA, PA. 18642 MADE & PRINTED IN U.S.A." printed on them, and the United Kingdom Garbage Pail Kids Giant Stickers pack wrappers have "MADE IN THE REPUBLIC OF IRELAND BY TOPPS IRELAND LTD., BALLINCOLLIG, CORK. ©1986 TOPPS CHEWING GUM, INC." printed on them.